Online photo processing, where real photographic paper is used for prints, is nowadays as popular as traditional photo labs used be in the 1990's. The routes to the lab are becoming increasingly varied and flexible. Apart from the existing routes via the Internet using Windows PC, Mac or Linux software, a Point of Sale Terminal or online, ECCE TERRAM is now introducing its first "Photo2lab Client for iPhone" at the PMA 2008 in Las Vegas. Oldenburg, Germany and Las Vegas, NV. January, 29th, 2008. -- ECCE TERRAM has already announced new versions of its offline software clients and its middleware for the PMA 2008 in Las Vegas, and communicated its expansion to New Zealand and Australia. Today the internet solutions specialist is presenting a new global highlight. During summer 2007 Apple's launch of a completely new smartphone, called the iphone received much public attention. With 4 million units sold during the first 200 days it is the most successful mobile phone launch. Steve Jobs, the legendary Apple boss announced a software developer's kit last October for third party applications. This gave ECCE TERRAM the starting shot for the development of a photo print order client for the iPhone. ECCE TERRAM CEO Frank Simon states: "We think that thanks to the intuitive user interface and the iPhone's Multi Touch Display this is the first attractive and user-friendly mobile phone photo print application that will be loved by its users." Right from the onset it was clear that the iPhone users define which application can be sensibly marketed. Spontaneous snaps from the holidays, a party, on concerts or a snapshot of something interesting on the road. The moment describes the motive and shows why the software developer has such faith in its new iPhone application. "The iPhone is the ideal tool to help establish photographic products as part of modern, digital life." says Frank Simon, CEO. The iPhone's photo printing range will kick off with a mini-photobook (10x15cm, 16 pages) and a post card service. The user selects photos, creates a postcard with text and images in the editing tool, moves the images with one finger, rotates and zooms pictures with two fingers and does a double click to browse. 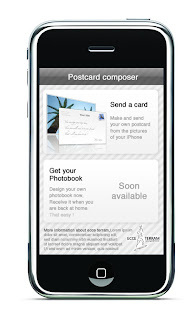 The application can pick the postcard's recipients postal address straight from the contact list. ECCE TERRAM's "Photo2lab" services production partners print the post cards and post them directly to the recipient - or the photo book to the buyer or to a delivery address for a present. ECCE TERRAM expects to present the final version shortly after Apple publishes its SDK (Software Development Kit). Further information regarding ECCE TERRAM at the PMA can be found at www.iphone2home.net . ECCE TERRAM was founded in Oldenburg by Frank Simon in 1996. Its web applications are used in the photo processing industry and beyond by blue chips like chip maker Infineon or German publishers like “Die Zeit” or “Gelbe Seiten” (German Yellow Pages). Since 2001 ECCE TERRAM is owned by the ECCE TERRAM Holding GmbH and the Pilet International S.A..
IITM is a specialist agency and will be delighted to arrange interviews. IITM will be pleased to provide an image, NFR versions, sample photo book for review as well as background information. Catalina Martínez, Head of Communication. Specialist developer ECCE TERRAM is showing at this year’s PMA how setting up a digital photo processing service in store or online is becoming easier with open software modules. ECCE TERRAM is also celebrating a new mile stone with 132 million photo prints being ordered through its middleware software components. These solutions help to improve photo services' independence and negotiation power and provide access to a range of components to cover varying requirements. Oldenburg Germany and Las Vegas, NV. January 22nd, 2008 – Online photo services converting digital images into traditional photographic paper prints are reaching the volumes of traditional photo labs in the 1990’s. Digital photo processing is a growth industry, but only a few developers have the experience and depth to create complete 'end user to photo lab' software solutions. The specialist Internet software developer ECCE TERRAM will be presenting the latest 'off the shelf', modular software solutions for online photo services, web portals, photo labs and purchasing associations at the international PMA exhibition in Las Vegas in January 2008, including client software and middleware releases currently in preparation. Together the Photo Lab Software processing components build flexible, state-of-the-art solutions. These range from order processing using online stores, point-of-sale terminals and offline software clients for Windows, Macintosh and Linux using an open protocol connecting to any photo lab or printer. The PTS middleware processes the orders using a central user database, which allows splitting orders to cover production requirements (e.g. mixed orders for standard prints, posters and gift items). Lab plug-ins built the third layer in ECCE TERRAM’s ‘Photo2Lab’ solution. The lab plug-ins currently support for example DPL, Allcop, ORWO, CeWeColor, DWM and Frontline. Increasingly specialists from the growing sector of photo book, calendar and gift item printing, like Ifuse, Snapmania are being supported by ECCE TERRAM. At PMA ECCE Terram is adding ICC Profiles to its Middleware as an option for photo labs catering for professional photographers. These solutions allow to indicate image optimization for individual image files and make re-ordering prints easier. In addition, the ECCE Photo Suite offline client will integrate the HDX4 Photo Manager. It serves to optimise the pictures per mouse click before uploading them to the Internet, in order to bring out the best of the photographs. This is important because large photo labs find it increasingly costly to correct or optimise images in photo albums and calendars. The Managing Director of the developer ECCE TERRAM, Frank Simon states: "Among our customers are ORWO, Farbglanz Imaging, Pixelnet, Focus, TV Spielfilm, Kodak and many more. We are proud that in the past year 132 million image prints have been processed through the installed base of ECCE middleware solutions." ECCE TERRAM created the new generation of offline photo ordering clients (Windows, MacOS and Linux) with a modular structure. New modules for photo book and calendar design are being released during the PMA Trade Fair. A new postcard module which handles franking and mailing directly to the cards recipient will also be revealed during the PMA. The applications are brandable through graphics, logos and colors and are used by labs and services of different sizes, from large central labs like ORWO and DPL, book and gift printers to mini labs. Catering for European and international businesses ECCE TERRAM’s applications are easy to localize and are available in several European languages. ECCE TERRAM practices these values with its solutions shown at PMA Booth No. : K 191-1 from January 31st to February 2nd, 208. Publishing permission granted; 706 words. Copy or link appreciated. Cambridge, 16 Jan 2008. -- FotoInsight, a leading independent digital photo service, expects the crystal photo ware to be popular as Valentine’s and Mother’s Day gifts. “Love is a special feeling and so it must be expressed in an extraordinary way, Valentine's Day is the perfect occasion. So Valentine's Day gifts are important to make your day memorable in its way” states Catalina Martínez, Head of Communication at FotoInsight Ltd. When searching for Valentine’s Day gift ideas for a girlfriend, boyfriend, wife or husband the personal touch is desired and candy and flowers can’t provide it. Online digital photo services like FotoInsight can help transforming an individual photograph into a Valentine present that will be cherished and remembered for years to come. Publishing permission granted; 668 words. Copy or link appreciated. FotoInsight Ltd was founded in 2003 in Cambridge and runs an easy to use digital photo processing service, offering an extensive array of award-winning photographic print and gift items as well as the CeWe Photo books, photo posters, photographic calendars and photos on canvas printing. Customers benefit from patented development processes and the experience of Europe’s largest independent photo lab with an installed capacity of 18 million prints per day. 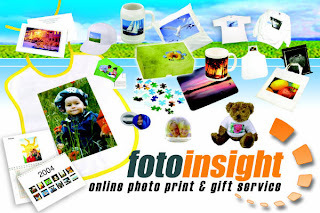 Photos ordered through http://fotoinsight.co.uk are developed in one of 16 strategically located, state of the art photo labs with an output of over 3 billion prints per year. German specialist developer ECCE TERRAM is celebrating a new mile stone with 132 million photo prints being ordered through its middleware software components. These solutions help to improve photo services' independence and negotiation power and provide access to a range of components to cover varying requirements. At the International Photo Marketing Association Convention and Trade Show in Las Vegas it will be showing photo lab and Internet solutions available in Europe, which ECCE TERRAM will launch in New Zealand in April 2008 and in Australia May 2008. Online photo services converting digital images into traditional photographic paper prints are reaching the volumes of traditional photo labs in the 1990’s. Digital photo processing is a growth industry, but only a few developers have the experience and depth to create complete 'end user to photo lab' software solutions. The specialist Internet software developer ECCE TERRAM will be presenting the latest 'off the shelf', modular software solutions for online photo services, web portals, photo labs and purchasing associations at the international PMA exhibition in Las Vegas in January 2008, including client software and middleware releases currently in preparation. ECCE TERRAM is announcing the launch of its Photo2Lab solutions in New Zealand (April 2008) and Australia (May 2008) with lab partners and dedicated local server in. The ECCE TERRAM Photo2Lab solution is unique in allowing photo services to receive and allocate print orders to their own photo printers, to third party central labs, to photo gift specialists or to channel orders on a case by case basis. Photo processing web solutions from large central labs have been developed for them to create an unbreakable tie between shops or portals and the supplying photo lab. Large central labs are building a dominant position, weakening smaller photo service’s negotiation power. ECCE TERRAM’s Photo2Lab is ready to plug into different photo labs, guaranteeing photo stores and web portals independence from dominant labs. With solutions developed using Web 2.0 technologies like SOAP, WSDL, Ajax etc. ECCE TERRAM offers a diverse range of components for photo portals, including support for ICC Profiles for professional color management demands. Together the Photo Lab software processing components build flexible, state-of-the-art solutions. These range from order processing using online stores, point-of-sale terminals and offline software clients for Windows, Macintosh and Linux using an open protocol connecting to any photo lab or printer. The DPS middleware processes the orders using a central user database, which allows splitting orders to cover production requirements (e.g. mixed orders for standard prints, posters and gift items). Lab plug-ins built the third layer in ECCE TERRAM’s ‘Photo2Lab’ solution. The lab plug-ins currently support for example DPL, Allcop, ORWO, CEWE Color, DWM and Frontline. Increasingly specialists from the growing sector of photo book, calendar and gift item printing, like Ifuse, Snapmania are being supported by ECCE TERRAM. ECCE TERRAM created the new generation of offline photo ordering clients (Windows, MacOS and Linux) with a modular structure. New modules for photo book and calendar design are being released during the PMA Trade Fair. A new postcard module which handles franking and mailing directly to the cards recipient will also be revealed during the PMA. The applications are brandable through graphics, logos and colors and are used by labs and services of different sizes, from large central labs like ORWO and DPL, book and gift printers to mini labs. Catering for European and international business ECCE TERRAM’s applications are easy to localize and are available in several European languages. The ECCE TERRAM Internet Services company will go to Las Vegas to present its Photo2lab Software Suite on the main photo trade fair PMA, which will take place from 31 January to 2 February 2008. Integrated into the Photo2lab Software Suite is the HDX4 Photo Manager of HDX4 GmbH. This is a HDX4 Photo SDK for professional picture optimisation. HDX4 GmbH has specialised in the development of software all about the topics of burning and multimedia. A suitable tool for digital photography is the SDK HDX4 Photo Manager, which other companies can license to upgrade their own software with new functions. SDK includes the two modules HDX4 Natural Enhancement and HDX4 Upscaling, both proprietary developments from the technology laboratories of HDX4 GmbH. A distinctive feature of the HDX4-modules is that they can help to turn any snapshot into a really professional photograph – it only takes a mouse click. So far, photographers rather used trial and error to adjust brightness, contrast and colours; now the software can detect imperfections of pictures and corrects them without need for further user intervention. Frank Simon of ECCE TERRAM: "Thanks to the HDX4-functions, dark pictures with low contrast and matt colours are definitely a thing of the past. Suddenly, the sky prints perfectly blue and details, which were in the shade become visible again." Among the companies having licensed the HDX4 Photo SDK is the German company ECCE TERRAM Internet Services. Photo2lab Software Suite has been especially developed for digital photo services, which want to digitise all procedures from the order to printing in the laboratory. Part of this suite is the eccePhoto Offline-Client, which enables the customer to select his own pictures that are to be ordered as prints or to be used as fun products or for the creation of photo albums or calendars. Integrated into the Offline-Client is the HDX4 Photo Manager. It serves to optimise the pictures per mouse click before uploading them to the Internet, in order to bring out the best of the photographs. This is important because large photo laboratories cannot carry out later modifications of photo albums and calendars – in contrast to prints – without large effort. The Managing Director of the developer ECCE TERRAM, Frank Simon states: "Among our customers are ORWO, Farbglanz Imaging, Pixelnet, Focus, TV Spielfilm, Kodak and many more." ECCE TERRAM Internet Services presents its Photo2lab Software Suite with the integrated HDX4 Photo Manager on the worldwide most important photo trade fair PMA, which takes place in Las Vegas from 31 January to 2 February 2008. It can be found on stand K191-1 (ECCE TERRAM GmbH, LVCC, 2nd floor). HDX4 GmbH was founded in 2001 and has its headquarters in Dortmund, Germany. The medium-sized company mainly deals with the development of new picture-and video optimization, which considerably increases the quality of the source material by means of a self-developed technique. Via SDKs these functions can be taken over to any Multimedia-Software. HDX4 GmbH also offers all-encompassing support for a veritable cornucopia of video codecs, including (but by no means limited to) MPEG 1/2/4 (of course, the latter in the older H.263 as well as the newest H.264/AVC styles), Flash and MJPEG. The technology covers a range of audio formats, like AAC-LC, AAC-HE, ADPCM, AMR-NB and G.726, and an arsenal of container formats, such as 3GP/3GPP, AVI, MP4 and ASF. Detailed information can be found at www.hdx4.com.